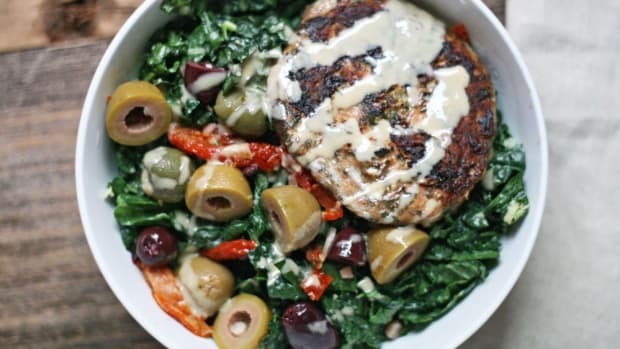 Looking for a simple weeknight dinner that checks all the boxes for a balanced and wholesome meal but doesn’t take hours to make? 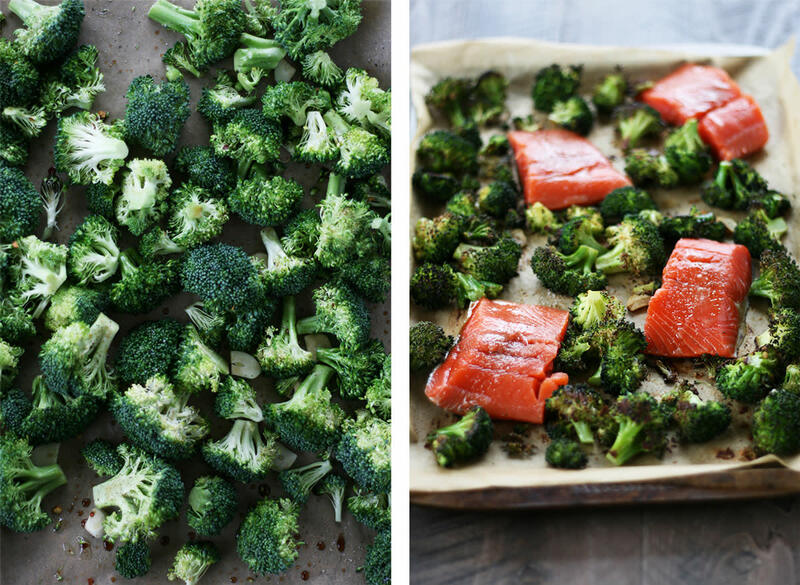 This one sheet pan Asian salmon and broccoli recipe is going to be the newest way to win at dinnertime. 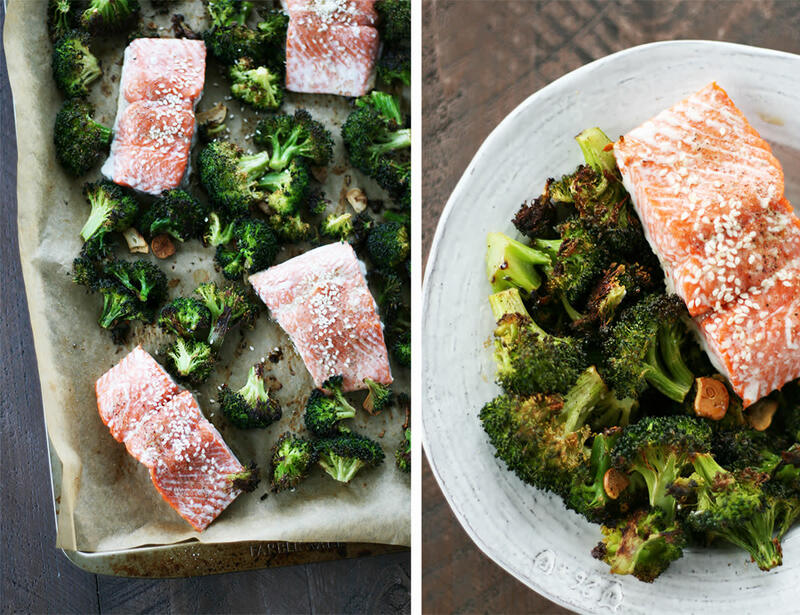 This Paleo-friendly Asian salmon and broccoli recipe requires just a few minutes of prep time and less than 30 minutes to cook in the oven. The magic of one-sheet pan dinners is that everything cooks together ensuring minimal dishes and maximum flavor. 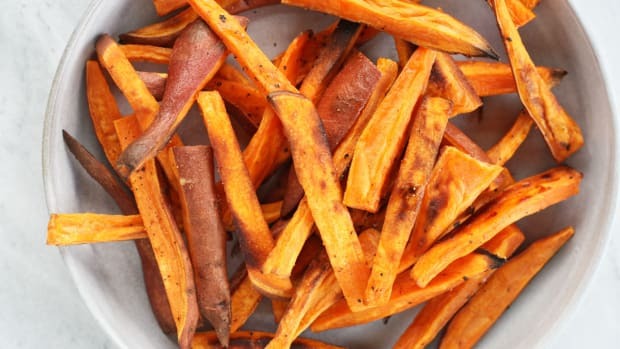 Winter is the perfect time to roast everything in the oven. 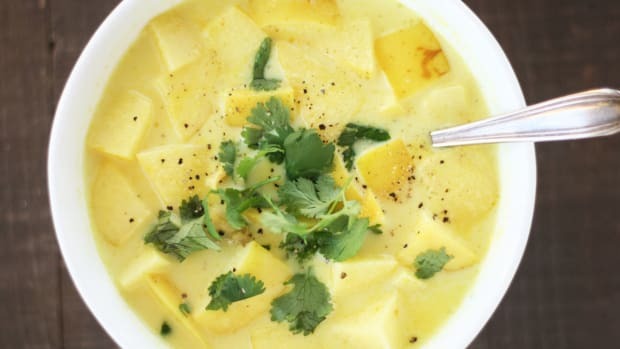 Not only will it warm up your kitchen, but also it’s perfectly suited for heartier vegetables in season at this time. Take broccoli, for example. This super vegetable is a bit green and crunchy while raw, but tastes sweet and nutty when caramelized in the oven. Adding garlic, avocado oil, coconut aminos (a Paleo-approved soy sauce alternative), and red pepper flakes boosts the mouthwatering-quality of this roasted broccoli dish even more. Along with tasting delicious roasted, broccoli boasts numerous health benefits. Broccoli is a supreme source of vitamin K; just one cup provides 245 percent of the recommended daily value. Vitamin K plays an important role in the blood clotting process as well as support bone growth. 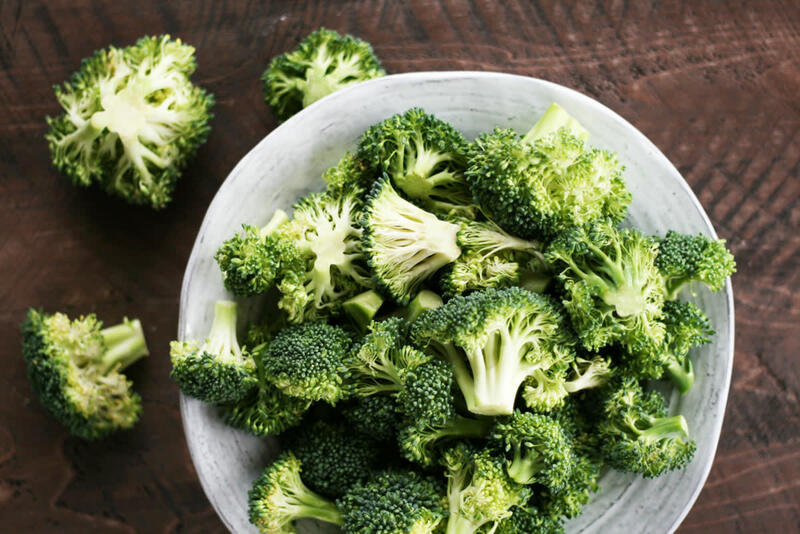 Broccoli is also filled with vitamin C and E, folate, fiber, B vitamins, potassium, iron, and calcium, as well as antioxidants and phytochemicals that protect against certain diseases such as cancer, high blood pressure, and osteoporosis. Salmon is filled with omega-3 fatty acids, vitamin D, B12, and B3, selenium, protein, and phosphorus, among other vitamins and minerals. 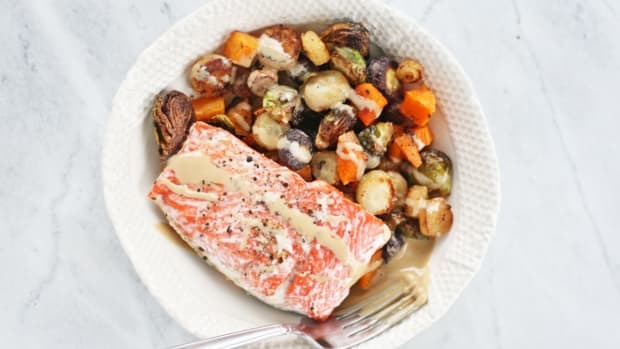 Choose wild salmon over farm-raised salmon whenever possible, often labeled as wild Sockeye, Chinook, Chum, Coho, or Pink. Farmed salmon, often labeled Atlantic, is raised on antibiotics, grain, and corn, rendering a less nutritious and unsustainable protein. 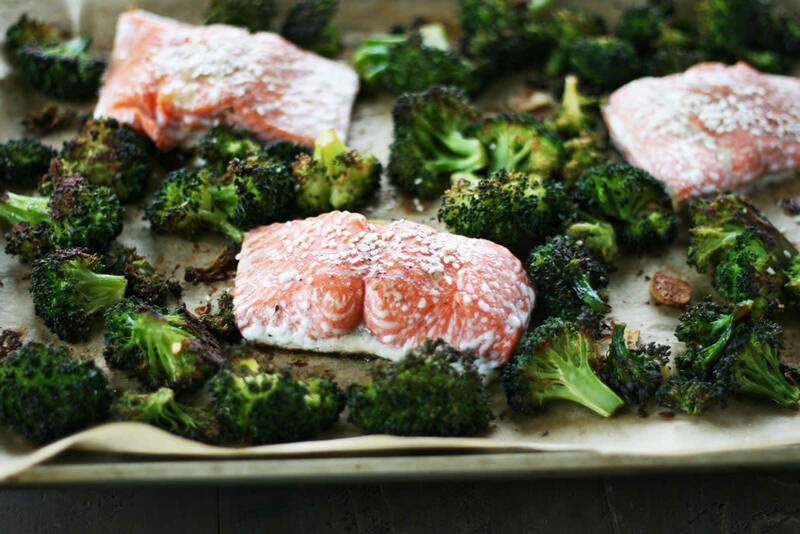 A one-pan wonder filled with Asian flavors, nutrient-rich broccoli, and heart-healthy salmon can be yours in mere minutes. Serve alongside brown rice or quinoa for an extra healthy carbohydrate and drizzle with sesame oil for a hint of flavor as well. Dig in! 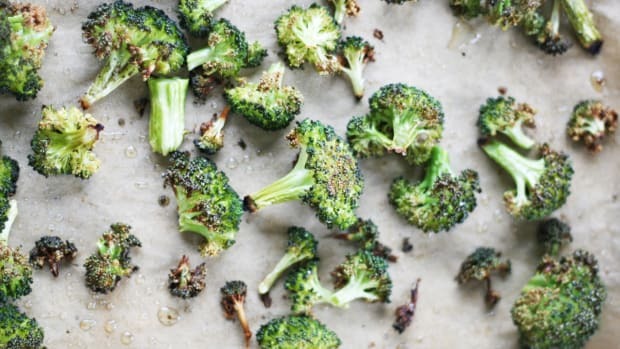 Cut broccoli into bite sized florets and add to lined baking tray along with sliced garlic. 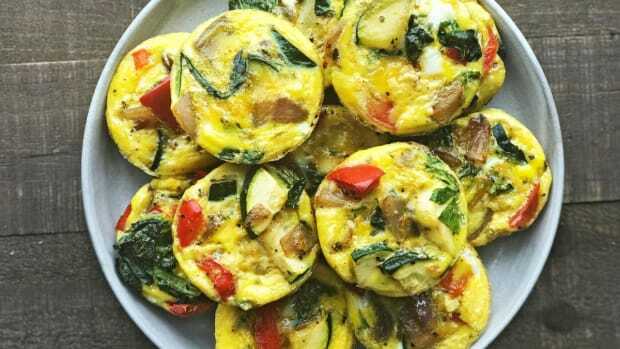 Drizzle with two tablespoons of coconut aminos and two tablespoons of avocado oil and sprinkle with red pepper flakes, sea salt, and black pepper. Roast broccoli for 20 minutes, giving the tray a good shake and stir half way through. Remove broccoli from oven and reduce oven temperature to 350 degrees Fahreinheit. 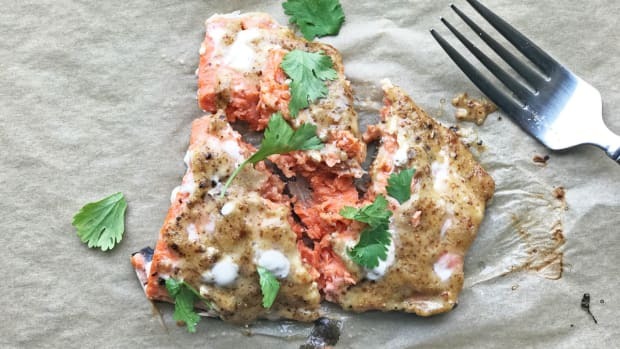 Make small holes for salmon and add salmon to the tray. 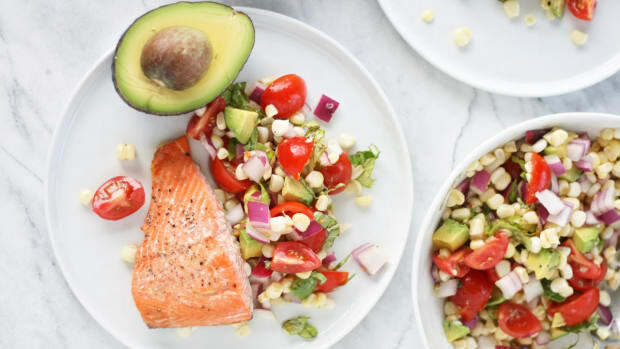 Drizzle each piece of salmon with remaining one tablespoon of coconut aminos and half tablespoon avocado oil. Season with sea salt and pepper, to taste. Roast tray for 10 more minutes, or until salmon is cooked and can flake easily with a fork. Remove from the oven and sprinkle with sesame seeds.